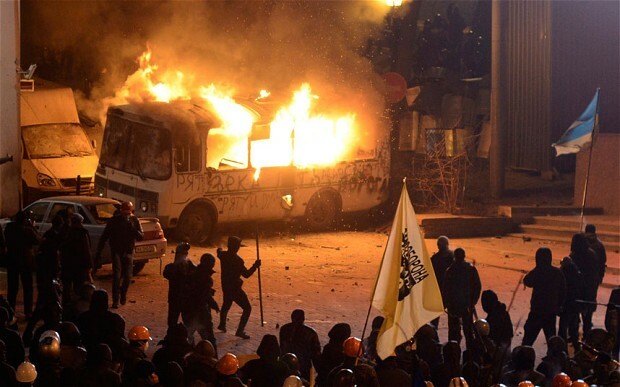 The Ukrainian government has agreed to meet opposition leaders in a bid to resolve the stand off in the streets of Kiev following the worst night of violence in the city since demonstrations broke out two months ago, the opposition has said. Vitaly Klitschko, a former world boxing champion and the most popular leader of the pro-European opposition, said President Viktor Yanukovych had agreed to hold talks on Monday after an emergency meeting at his residence outside Kiev on Sunday night. “As far as I got it, there will be a meeting between the leaders of the opposition forces and the president in the second half of the day tomorrow,” Mr Klitschko said in a television interview late on Sunday night. Mr Klitschko, who was attacked by a protestor armed with a fire extinguisher when he attempted to halt the clashes on Sunday, said Mr Yanukovych looked worried during the one-on-one meeting. “He is concerned. Every minute a man came to him and handed a piece of paper from which he received the information,” he said in comments released by his Udar Party’s press service. “I understood that he was closely following events at Maidan and aware of everything. I told him that the situation is on the verge of civil conflict and needs urgent intervention,” he said..
Russian television reported that over 100 people were injured in clashes that broke out in central Kiev following a protest against draconian laws restricting demonstrations passed by parliament last week. After a peaceful mass rally in the afternoon, hundreds of demonstrators sought to storm police cordons near the Verkhovna Rada parliament and close to the stadium of the legendary Dynamo Kiev football club in central Kiev, witnesses and AFP correspondents said. In the most violent scenes since the start of the protests in November, demonstrators set five buses and two trucks on fire while the air filled with the stench of tear gas. Their faces covered by scarves or ski masks, many of the protesters wielded sticks or even chains. They were confronted by helmeted riot police equipped with shields who at times adopted a “tortoise” formation to protect themselves from falling projectiles. The standoff was still continuing in the early hours of Monday morning after some 12 hours of clashes, with security forces making extensive use of water cannon in a bid to douse the protesters and push them back. Opposition leaders called on the protesters to refrain from using force but their calls were ignored. It was not clear who was behind the clashes with police, which appeared to have been a well-organised move. Ukrainian media linked the action to a hitherto little-known right-wing youth group called “Right Sector”. The president received MR Klitschko and promised early Monday to create a special commission of officials and opposition set up by national security council secretary Andriy Klyuyev to solve the crisis, the boxer’s party and the presidency announced. The new laws allow the authorities to jail those who blockade public buildings for up to five years and permit the arrest of protesters who wear masks or helmets. Other provisions ban the dissemination of “slander” on the Internet.